Solar energy: "Hannover catching the sun"
Hannover catching the sun – that was the title of an event, which took place on the 11th of June of 2014 at Connox, informing other companies about the advantages of solar energy. 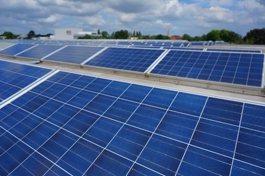 The usage of solar energy for one’s own was the main theme of this event, which has been initialized by the city of Hannover, the local sponsor proKlima and the climate protection agency of the region. The most important thing to learn: Even if the compensation for electricity went back because of the EEG-novel, solar energy is still attractive to be used on one’s own, since the sun doesn’t bill anybody. After the greetings of the borough mayor Harry Grunenberg, the event started. 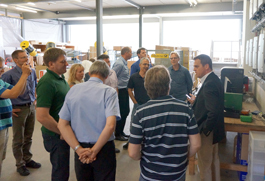 Connox manager Thilo Haas and the owner of the warehouse in the Eckener street 3, Michael Käse, explained their experiences with the big photovoltaic system which lies on the roof of the warehouse of the Connox GmbH. The interested audition included representatives of different branches, since economy, technique and legal questions of solar energy aren’t only interesting for energy intense industrial businesses. With an annual performance of about more than 60,000 kWh, the solar system on the roof oft he Connox home design shop spends more than doubble as much as the needed electricity oft he company, which has more than 35 employees. The advantages and disadvantages of the sun energy production were vividly discussed, which can also be utile in times of decreasing electricity compensation – not only advantageous for the environment, but also for the budget: ”Solar energy is a question of attitude, with which it is as well possible to save money” , explained Thilo Haas. Solar energy is more affordable to be produced by companies, than to buy electricity from established providers. The best argument: The prices remain stable. Especially the direct consumption in the place the energy is gained was emphasized as theme of “Hannover catching the sun”. The last doubts of the participating companies of the business park Alter Flughafen were finally cleaned by the official side: The Rainer Konerding and Eberhard Röhrig-van der Meer presented consulting possibilities of the city of Hannover for commercially used buildings, the free solar check, informs interested companies individually and free. 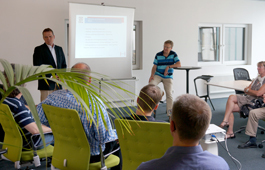 Energy consultant Rainer Tepe explained legal details and he emphasized as well the economic sense of solar energy. There was only one more thing to think about, even for rainy days: Hannover is on the best way to a sunny future.